FCI-CLASSIFICATION: Group 7 Pointing Dogs. The ancestors of the Hungarian Vizsla came into the Carpathian Basin with the nomadic Hungarian tribes. Written descriptions and graphic illustrations are found in documents of the 14th century already. From the 18th century, his importance as a hunting dog has been increasing steadily. As early as the end of the 19th century, competitions for pointing dogs were organised in Hungary, in which Hungarian Vizslas (among others) participated with great success. 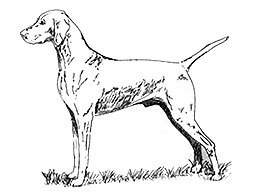 In those days, other Gundog breeds most likely played an important part in the development of the breed. The specific modern breeding started in 1920, as a result of which, the Short-Haired Hungarian Vizsla received recognition by the FCI in 1936. He is a medium sized, elegant gun dog of noble appearance with a short russet gold coat. His rather light, dry, lean structure embodies the harmony of beauty and strength. · The body length slightly exceeds the height at the withers. · The depth of the brisket is slightly less than half the height at the withers. · The muzzle is slightly shorter than half the length of the head. The Hungarian Vizsla is a versatile gun dog that must be able to work in field, forest and water and have the following typical qualities. He must have an excellent nose, firmness on the point , be excellent at retrieving and have the determination to remain on the scent even when swimming, which he manifestly enjoys. He copes with difficult terrain as well as extreme weather conditions. As he is intended to be an efficient hunting dog then gun and game shyness, unwillingness to point and retrieve, as well a dislike of water are undesirable. Because of his easy going nature and his adaptability, he can easily be kept as a companion dog in the house. Lively, friendly, evenly tempered and easily trained. His outstanding willingness to keep contact with his master while working is one of his essential qualities. He cannot bear rough treatment and must be neither aggressive or shy. The head should be dry, noble and well proportioned. The skull moderately wide and slightly domed. A slightly pronounced groove runs from the moderately developed occiput towards the stop. The supercilliary ridges are moderately developed. The stop is moderate. His nose should be well developed and broad with nostrils as wide as possible. The colour of the nose harmonises in a dark shading with the coat colour. The muzzle is blunt, not pointed, with strong jaws that are strongly muscled. The bridge of the nose is straight. The lips are tight fitting with no pendulous flews. The jaws are powerful and the cheeks are strong and well muscled. The eyes are slightly oval and of medium size with well fitting eyelids. He has an intelligent and lively expression. The brown eyes harmonise with the coat colour, as dark as possible preferred. The ears are set on at medium height, a little backwards. He has fine leathers, which hang closely to the cheeks and end in a rounded V shape. The length is about three-quarters of the length of the head. He has a regular and complete scissor bite with the upper teeth closely overlapping the lower teeth and set square to the jaws with 42 healthy teeth according to dentition formula. Of medium length, harmonising with the overall appearance. The nape very muscular and slightly arched. Tightly fitting skin (no dewlap) at the throat. Viewed from the front they should be straight and parallel. Viewed from the side the legs are vertical and placed well under the body. Good bones and strongly muscled. The shoulders are long, sloping and flat with well attached shoulder blades. Flexible with strong dry muscles. Well angulated between the shoulder blade and upper arm. The upper arm is as long as possible and well muscled. The elbows fit close to the body, not tied in and turning neither in nor out and are well angulated between the upper arm and forearm. The forearm is long, straight and sufficiently muscled with strong but not coarse bone. The pastern joint is short and tight. The pastern is short and only very slightly sloping. The withers are pronounced and muscular. The back is solid, strong, well muscled, taut and straight. The muscles should hide the vertebral spines. The loin is short, broad, tight, muscular, straight or slightly arched. The portion from back to loin is well coupled. The croup is broad and of sufficient length, not to cut off short. It slopes slightly to the tail and is well muscled. The chest is deep and broad with a well developed, well muscled, moderately arched forechest. The sternum should extend as far back as possible. The sternum and the elbow should be at the same level. The ribs are moderately arched with the last ribs carried well back. The underline is elegant, tight, arching towards the rear and slightly tucked up. Viewed from behind they should be straight and parallel. Well angulated and with strong bone. The upper thigh is long and muscular with good angulation between the pelvis and upper thigh. The stifle is well angulated. The lower thigh is long, well muscled and sinewy. Its length is almost equal to that of the upper thigh. Good angulation between the lower thigh and the metatarsus. The hock joint is strong, dry and sinewy and rather well let down. The metatarsus is vertical, short and dry. The forefeet are slightly oval, with well knit, sufficiently arched, strong toes. The nails are strong and brown in colour. He has tough, resistant, slate grey pads. The feet are parallel when standing or moving. The hind feet are similar to the forefeet. Set on slightly low, strong at the base, then tapering. In countries where tail docking is not prohibited by law, the tail may be shortened by one quarter to avoid hunting hazards. If tail docking is prohibited, the tail reaches down to the hock joint and carried straight or slightly sabre like. On the move, it is raised up to the horizontal. It is well covered by dense coat. The typical gait is an animated, light-footed trot, elegant and far-reaching, with much drive and corresponding reach. Not exhausting gallop when working in the field. The back is firm and the topline remains level. Good, upright carriage. Pacing undesirable. Short and dense, should be coarse and hard at the touch. On the head and the ear leathers, it should be thinner, silkier and shorter. The hair underneath the tail should be slightly, but not noticeably longer. The coat should cover all if the body with the underside of the belly being a little lighter coated. No undercoat. Various shades of russet gold and dark sandy gold. The ear leathers may be a little darker, otherwise uniform in colour. Red, brownish or lightened colour is undesirable. A little white patch on the chest or at the throat, not more than 5 cm in diameter, as well as white markings on the toes are not considered faulty. The colour of the lips and the eye rims corresponds to the colour of the nose. The skin is tightly fitting, without folds and well pigmented. One or more missing incisors and/or canine and or premolars 2-4 and /or molars 1-2. More than two missing PM1. The M3 are disregarded. Not visible teeth are assessed as missing ones. Supernumerary teeth not in line with the others. Dark brown or pale yellow colour. Parti-coloured. Not uniformly coloured. White chest patch larger than 5 cm. Lacking pigmentation either on the skin or on the lips and eye rims.